We prefer to cook our own chick peas or garbanzos as they contain none of the salt or other additives found in most canned chick peas or garbanzos, and they cost much less, which is better for both our pocket books and health. If we are going to use the cooked chick peas or garbanzos on our salads and in another recipe, we usually double this recipe. 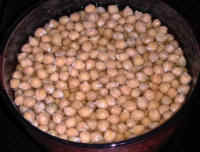 Some people believe that it is better to soak the chick peas in water in the refrigerator over night, drain them, and then cook them in the morning. From our experience, it seems to make no difference if we simply cook them without presoaking. No matter which way you choose, begin by inspecting, cleaning and washing the chick peas/garbanzos in a colander. The chick peas/garbanzos can be cooked either in a covered slow cooker over night on low heat, or in a covered pot on the stovetop. Placed the washed chickpeas or garbanzos in the slow cooker or pot. Add 5 cups of water for every pound of chick peas or garbanzos. 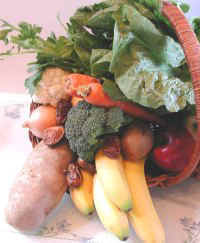 If cooking in a slow cooker, cover, and set the cooker to low, and in about 6 to 8 hours they should be cooked. Mix and taste a couple of them to make sure they are tender, and continue cooking if necessary, or if all the water has all been absorbed, and they are are the dry side, add a little more water. When the are cooked, turn off the heat. If cooking in a pot on the stovetop (as shown in the photo), start by bringing the water to boiling on high heat, and then immediately lower the heat to simmer and cover the pot, and let simmer for about two to three hours, mixing occasionally, and adding water if necessary to just cover the chick peas or garbanzos. When they are tender, turn off the heat. 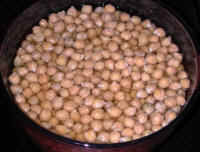 Cooked chick peas or garbanzos are great on salads, for making hummus, or in curry, soup, or stew recipes. 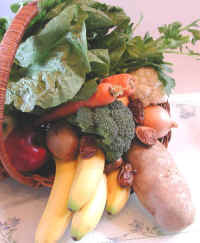 Leftovers can be stored in the covered pot, or in another covered container in the refrigerator for a few days.